Oh good heavens! It’s finally done–only ONE WHOLE freaking month after my goal of Rhinebeck. Nice. Since I’m sure no one can even remember what the hell project this is, I shall refresh you. I called this the Phildar Horizon Sweater because the yarn is called Horizon. If you’re interested in this sweater in this or the blue colorway, I bought my yarn from Val at Knit n Tyme in wonderful Canada. I don’t know Val, but I love her. 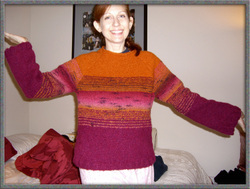 This pattern is from Phildar Automne 2006 and is model #24. The only mods I made were to make the arse one size and the boobages another–that only involves a bit of math to make them meet at the waist. Another mod was to the collar. The model in the magazine has some crazy welty collar and I wanted simple and plain. I opted for picking up and knitting a small self roll collar. Finishes the neck but doesn’t bind my swanlike neck or look funky. And of course, I made the sleeves longer because I have apelike arms. Eee eee. I’m glad it’s done and all those little ends are a thing of the past. Much weaving in, but I love this sweater so it was definitely worth it. I must add that my next project will be ONE color. I’m not nuts.